This page is a dedication to the beautiful brain of Betsey which was the reason why we have cute earrings and necklaces to wear for our parties. I accept being an accessory freak, but most of my wardrobe is composed of rare dangle earrings without much room for a necklace. But Betsey's designs blew my mind. In this page, I talk about the best of her collections and where you can buy them cheap. Every designer who deals with feminine jewelry would have a cupcake accessory to her credit. Betsey Johnson Cupcake Necklace is a glossy blend of candy colors with golden embossing. The golden touch makes it apt for adults, unlike the cheap made-for-kids cupcake jewelry. I could only find her cupcake earrings in stock in Amazon. But in stores like Kaboodle or Polyvore, there are pendants too. What surprised me was the variety that this woman could bring in the simple cupcake theme. All I could do was to compile them into a single picture! While all these designs have a bright shade, there is another one type called "Metropark" which has a grey shade. No other jewelry designer has dealt with the skull design better than Betsey. She came up with the Skull Necklace design, when skull pendants were restricted to guy's jewelry. The symbol, which is commonly related to danger and horror, became a docile and beautiful icon of style. What type of skull necklaces do I get? Skulls set with diamonds, decorated with a bow or a candy-pink rose on top. A must-have for teenage girls and a perfect gift for a Trendanista mom. Though I am in all praise for Betsey's necklace designs, there are few designs I didn't like. Here they are. 1. Yacht Club Anchor Charm Necklace: Navy blue was a wise choice. But the stripes and dots in blue and white, all over the charms made it look gaudy. Navy blue with pink is a rare combination for dresses. I don't understand what made Betsey to go for this totally mismatching blue, pink and white combo. 2. "In the Navy": Betsey should have had a bad experience in the ship, else I don't find a reason why her navy series is really bad. 3. 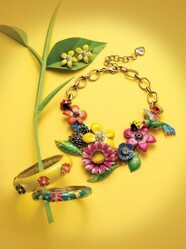 Rose Garden, Pearl Multi-charm necklace: I am a great admirer of Betsey's floral jewelry designs. Infact, I have been writing exclusively on that topic. But this one reminded me of the imperfect, incomplete bead necklace that my mom used to make for my dolls. Some necklaces look bad at sight, but great on the wearer. Most of Betsey's multi-chain necklace collections fall into that category. Perhaps, this too is like that.